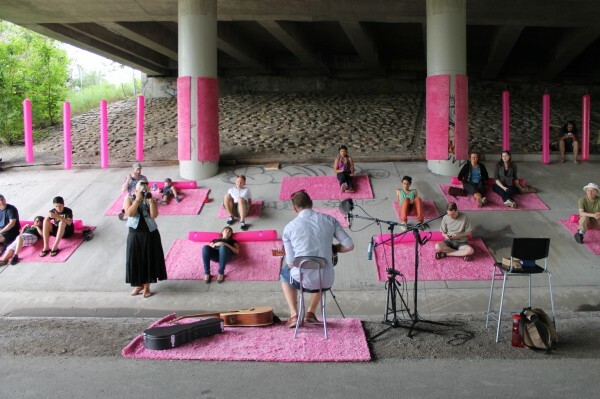 For one dreary rainy afternoon this past July, an underpass of Ottawa’s Queensway was overtaken by acoustic guitars and hot pink shag carpets. 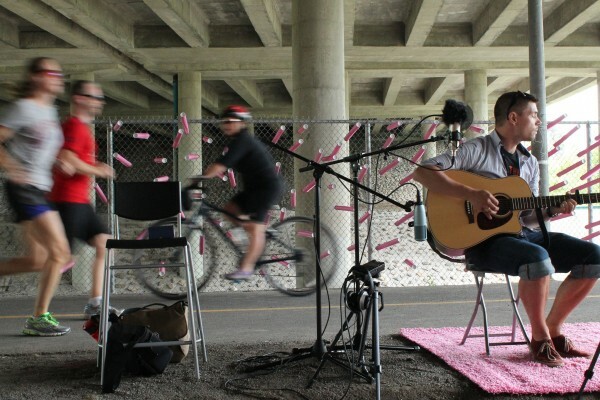 With bicycles and runners, and the rumble of the O-Train and highway as a backdrop, passersby were invited to play a song on the guitar or lounge on the carpeted concrete slopes and enjoy the music. A few months earlier, the organizer of Ottawa Musical Underground approached me after a presentation I gave on some tactical urbanism projects I had worked on with my team, Impromptu Playground. 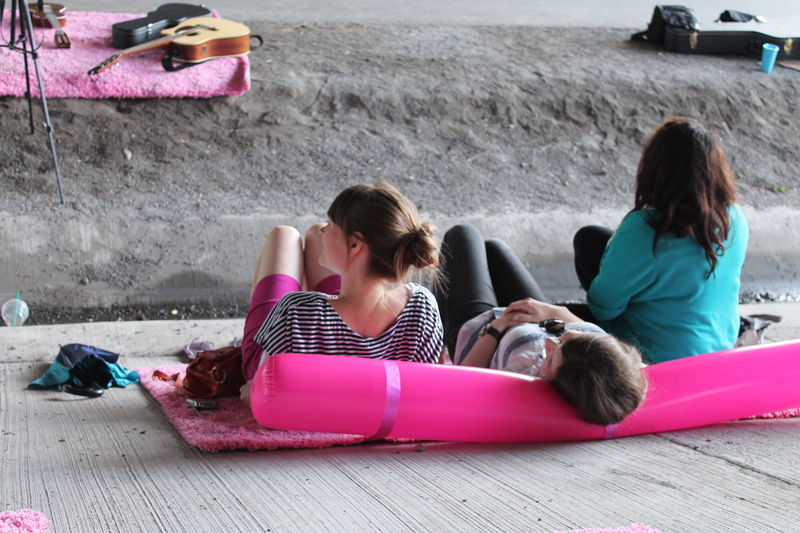 Musical Underground was doing musically what we were doing architecturally: appropriating public space and hoping to inspire passersby to pause and play with us. With micro-grant funding from Awesome Ottawa, we set out to collaborate on a pop-up venue. ‘Set the Stage’ transformed the normally unassuming and unattractive underpass. The minimal intervention of a dozen or so rugs and inflatable pool noodles brought attention to the grandeur of the massive structure. What was harsh and dark, became soft and bright. A space that is normally passed through became a place to hangout. For one day, it was a public livingroom and host to an awesome impromptu house show in the city. While planning for ‘Set the Stage’, we noticed a significant difference in our approach. Musical Underground usually set up shop in welcoming and public spaces, like farmers markets and parks. Impromptu Playground tended towards transforming inhospitable and unnoticed spaces, like parking spots and bus stops. Returning to our underlying musical and architectural goals, we realized we were both trying to bring attention to the potential of what normally goes unnoticed — the musical talent in our city who don’t have a stage and the interesting spaces that don’t get used. Tactical urbanism captures our imaginations in the many ways it disrupts and challenges the status quo. There is something exciting about citizens taking action and reclaiming space. The culture of DIY home improvement is slowly moving out into the streets and public spaces in our cities. People want to invest in improving our collectively owned property, as well as our private homes. Place-making is a practice in community-making. It is no surprise that tactical urbanism has taken seed in the grassroots. So much so that we tend to think of it exclusively in those terms but it is also having huge impact in the professional world. As a so-called ‘design professional’ with six years of university education in architecture behind me, it can be a challenge to straddle the professional and the grassroots, but it can also be extremely rewarding. Collaborating on tactical urbanism projects lets me challenge my role as both a citizen and a professional, and I try to contribute as both. The O-Train/Queensway underpass I chose as the site for ‘Set the Stage’ is itself an interesting example that disrupts the way we normally think about grassroots placemaking vs. professional design and city planning. It is full of layers of incremental interventions; beginning with major city infrastructure, casual usage and adaptations that get formalized and redesigned, leading to further tweaking and re-appropriations. The idea for the site came from a Jane’s Walks I had participated in during the spring. ‘Discovering the O-Train MUP’ followed the length of the recently opened phase I of the multi-use pathway that follows the light-rail O-Train (and former Canadian Pacific Rail) trench, and will eventually complete an important link in the city cycling network, connecting the Ottawa River pathway to the Rideau Canal pathway at Dow’s Lake. The pathway was a bit of a curiosity and unexpected surprise. Before it opened, cycling advocates were glad the city was pursuing additions to the cycling network but were not convinced this was a particularly useful addition. Local residents were glad that the city was investing in public green space but questioned if a strip of land running along a train ditch would add any value to the neighbourhood. The city was giving citizens amenities they had petitioned for but the location and design left them highly suspect. That is, until it opened. I have heard countless people describe how hard it is to remember life without the pathway. After only a year, it is a testament to the successful integration of the pathway into everyday life. That this outcome was a surprise is itself a bit surprising. Before the official pathway, as is still visible on the southern portion awaiting completion, there were many well-worn ‘desire paths’ connecting the dead-end streets that back onto the O-Train corridor to main roads. A few recent low-rise developments opted to include balconies that open out onto the space. This supposedly undesirable space was already a shared and well-used place, it just wasn’t recognized or publicized as one yet. The city just formalized and extended what was already there but the potential of which remained unseen until it became glaringly obvious. With relatively minimal intervention, the city significantly increased the function, safety, accessibility, and attractiveness of an underused and undervalued piece of land. An unofficial back alley became a public linear park and important transportation corridor. But it was literally trailblazing residents who laid the path, even if they themselves didn’t recognize it until the city stepped in. The transformation does not end with the city intervention. The community continues to improve and contribute to the space, using it in expected and unexpected ways. A curb ramp was installed ‘guerrilla-style’ where the path intersects with Beech Street without a curb-cut. During the Jane’s Walk, we ran into volunteers from a community organization collecting trash. Another Awesome Ottawa funded pop-up project posted ‘Walk Your City’ wayfinding signs directing path users to nearby local businesses and attractions. And graffiti artists continue to find place for their art/tags. As much as these examples point out missed opportunities or flaws in the city’s design, they also show the strength of community ownership and attachment to the space. The O-Train MUP shows the process of city-making and how it benefits from the interaction back and forth between citizens and professionals, between planning and acting. It’s a process that is often nearly invisible when it works so we tend to forget that it can work. This reflects some of my own experience as a design professional working on tactical urbanism projects. Our projects and process reproduce a lot of this kind of back and forth. Impromptu Playground is not a reflection of our design process. There is nothing impromptu about the multiple concepts we run through, or the nearly endless possibilities we consider in terms of how our installations might be used or misused. We troubleshoot technical, logistical, financial, and experiential design problems. The impromptu starts when we get out there and build it. No matter how thorough the design, things never go according to plan. We improvise and adapt to get the project built and then we see all the ways it actually gets used that we never planned for. We often find ourselves explaining that we are okay that our projects do not turn out as originally planned. Sometimes they exceed expectations. Sometimes they fall short. But they always succeed in surprising. We have found that the care and attention we put into designing our projects is part of what makes them open to being adapted and appropriated in ways we never anticipated. We learn from the flaws that get revealed and celebrate that we succeed at our goal of engaging people with each other and space. You can’t design how people will use space but you can design space for people to use. It was a great idea! Too bad the pink tubes were dumped on the other side of the fence and continue to provide an ugly reminder of the event. I hope that, another time, plans are made to take the debris with you, just like hiking. You bring it, you take it back out. Thanks! Well written and relevant. Thank you Sarah. Having run a farmers market in Little Italy for four years, the connections you mentioned were not only great for cycling and moving about, but also for the businesses. Now running a market in Beechwood Village and very involved with the development of the East End, I’d like to hear what you think of our part of town. Hi Riek, unfortunately that was an example of things not working as planned with a negative outcome. We wanted to leave a part of the project up for a couple days as a fun reminder/curiosity for anyone who missed the main event. We intended to return to collect them but someone had tossed them over the fence in the meantime. In our experience, people usually seize such opportunities to do something creative of their own. Hi Matt, there are of course several working definitions to tactical urbanism. I personally follow the school of thought that references Michel de Certeau’s use of ‘tactics’; usually temporary challenge to the status quo, often with the hope of creating longterm change (such as the examples you give) by bringing attention to problems in the city. The longerterm examples generally require official support.